“Modern Indian done with style!” Atul Kochhar’s swish Mayfair destination in very contemporary, first-floor Berkeley Square premises put in a much stronger showing than in last year’s survey. True, “when the dining room is quiet the atmosphere can feel a little strained”, but when it fills up it’s “much more vibrant”, and at its best the cuisine here is “really stunning and beautifully presented”. STOP PRESS – in August 2018, Kochhar left the restaurant which he founded, whose cuisine will now be led by Executive Chef Brinder Narula, who has been with the group controlling Benares for three years. Opinions again divide on Atul Kochar’s acclaimed contemporary Indian, which occupies a sprawling and first-floor site on Berkeley Square. Critics – who accuse it of “going through the motions” – drag down its overall ratings, but the majority lavish praise on his “innovative” cuisine’s “delicate spicing”, and say a meal is a “wow, how-did-they-make-it-taste-so-good experience”. Fans still laud the “subtle, gorgeous flavours” of Atul Kochar’s cuisine which have made this “classy” if slightly “oddly furnished (shades of the ’70s)” gourmet Indian, in rambling first-floor premises by Berkeley Square, one of London’s best-known dining destinations. However, its ratings have cratered in recent times due to too many experiences of “Keystone Kops” service and food that just seems “expensive and very average”. “Beautifully thought out” and “adventurous” ‘nouvelle Indian’ cuisine continues to make Atul Kochar’s slick-looking (but “windowless”) Mayfair operation one of the Capital’s best-known dining destinations; slipping ratings, though, accompany fears that it risks becoming for “expense accounters only”. Have you eaten at Benares? A staple within the London fine dining scene, Benares, a Michelin starred restaurant specializing in modern Indian cuisine with a distinct British twist. Located in the heart of Mayfair, the sophisticated ambiance and detailed service compliment the flavour infused dishes and enhanced by locally sourced ingredients. Boasting four private dining rooms, as well as an intimate bar area, Benares is able to accommodate all celebrations, whether corporate or personal, and is available for exclusive hire for larger functions. Boasting four private dining rooms, as well as an intimate lounge, Benares is able to accommodate all celebrations, whether corporate or personal, and is available for exclusive hire for larger functions in exclusive Mayfair. Reviews of Benares Restaurant in W1, London by users of Hardens.com. 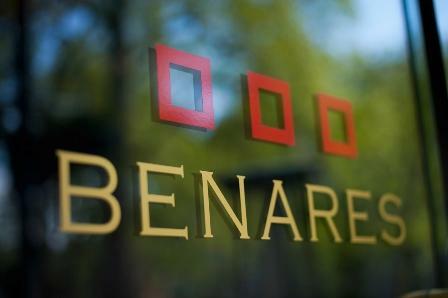 Also see the editors review of Benares restaurant. "Good and interesting dishes, a bit pricey perhaps even for that quality. Service superb once it had got going. Other punters a bit noisy and corporate, maybe past its best...?" Post your own review of Benares and contribute to our annual restaurant review guide.